Do Birds Carry Their Young? We believe that the first principles and ordinances of the Gospel are: first, Faith in the Lord Jesus Christ; second, Repentance; third, Baptism by immersion for the remission of sins; fourth, Laying on of hands for the gift of the Holy Ghost (A of F 1:4). What would happen if you went to college before you went to kindergarten? Could you learn to add numbers before you learned to count? Could you run before you learned to walk? When you learn something, you usually start with the simplest part of it, then move on to a more difficult part. You put first things first. 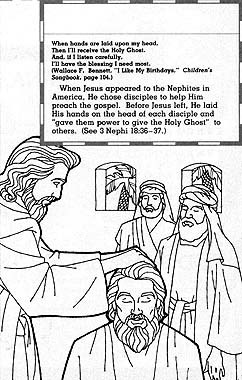 Joseph Smith said that when you become a member of The Church of Jesus Christ of Latter-day Saints, the first things that you need to do are to have faith, to repent, to be baptized, and to have those with the proper authority lay their hands on your head so that you can receive the gift of the Holy Ghost. When we obey these first principles and ordinances, we can then learn other things that Heavenly Father wants us to learn and do. Color the four word strips above, then carefully cut them out. 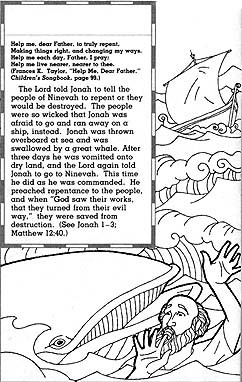 Each verse, picture, and story on these pages are examples of either faith, repentance, baptism, or the gift of the Holy Ghost. Read these examples, decide where each word strip belongs, and glue it in place. 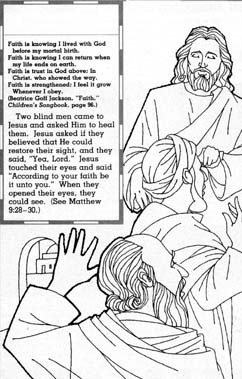 Use this completed poster to teach a lesson in family home evening on the fourth article of faith. Faith is trust in God above; In Christ, who showed the way. Faith is strengthened; I feel it grow Whenever I obey. Be baptized by immersion Through sacred priesthood pow’r. And have the Holy Spirit To guide me ev’ry hour. Then I’ll receive the Holy Ghost. I’ll have the blessing I need most. 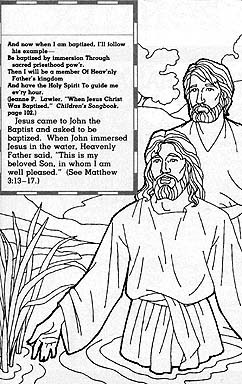 Have children relate or illustrate personal experiences demonstrating faith, repentance, baptism, and the gift of the Holy Ghost. Have children recite or sing four poems on pages 12–13. Divide into small groups; each group learns one line, then puts lines together. Put different-size cans or rocks labeled wrongdoing in sack. Have child carry it around. Tell children that weight of our sins can hold us back from living with Heavenly Father. We can rid ourselves of our sins by repenting. Take contents out of sack and say that when we repent, our sins are forgiven, and we can forget them. We no longer have to bear their heavy burden.